This top-quality, dependable, handcrafted wooden lure is individually lathe-turned, hand-sanded, air brush painted with top quality polyurethane, and then clear coated. Wiley Lures are assembled with stainless steel hardware, Mustad or VMC hooks, Lexan lips, and decal or plastic eyes. For Wiley Lures In Iowa. April 5, 2019 – Dale Wiley phoned this morning to say that he is running way behind in getting orders out and that it may be a couple of more months until he can get my order to me. 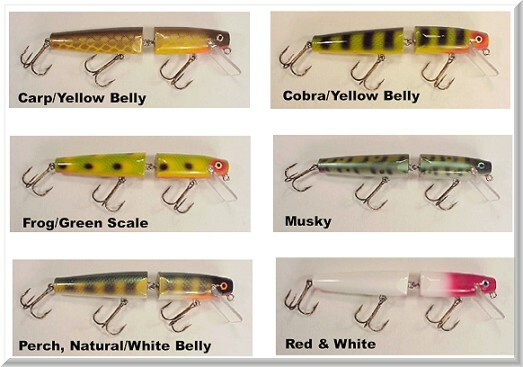 So, hold on Wiley lovers, more lures will be coming soon. Every Wiley Lure is individually water-tested on a rod and reel in a local pond to assure proper action, then resealed with clear coat so they are ready for serious muskie fishermen and women. The "Wiley" name is on every lure belly. If it’s not there, it’s not an original Wiley Lure. These lures have proven again and again over the years to be the ones that muskie fishermen and women trust, and have ranked in the top ten of all-time best muskie lures in the Muskies, Inc. data base for years. The 5.5” Muskie Killer lures dive to 6 feet in depth; the 6” Deep Divers go down to 14 feet, while the 7” Headshakers and 8” Muskie Kings dive to 10 feet. 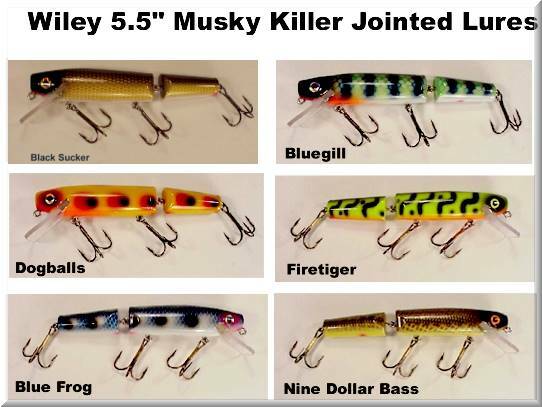 We are offering 7 patterns of the 5.5 inch jointed Musky Killer for only $29.00 each. Coachdog, And Perch Special Are The ONLY Available Colors!!! 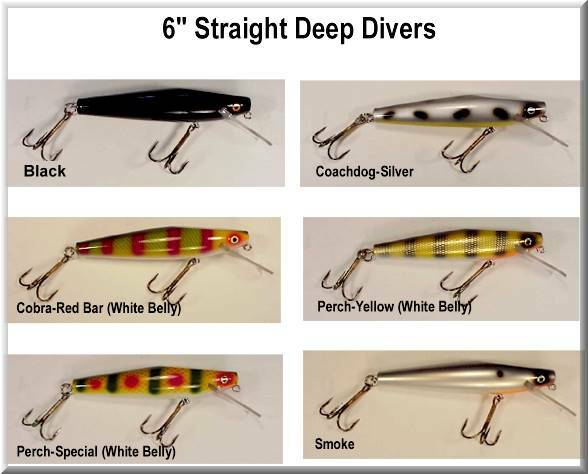 We are offering 7 patterns of the 6 inch straight Deep Diver for only $32.00 each. The Mud Puppy Is Out Of Stock!!! We are offering 7 patterns of the 7 inch jointed Headshaker lures for only $33.00 each. The Black Perch And Orange Perch Are Out Of Stock!!! We are offering 6 patterns of the 8 inch jointed Musky King for only $35.00 each.